As we mentioned in our first blog about Seville, we were fortunate to watch a professional ham-cutting contest. We had tasted this amazing ham during our previous travels in Spain and we always wondered how and where it was produced, since its flavor is so completely different from any other we had ever eaten. 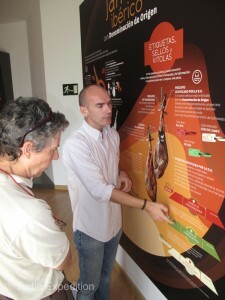 Here’s a little more about the famous and delicious Jamón Ibérica de Bellota. You may not find this ham at your local deli, but it’s worth looking for. The Black Iberian Pig lives primarily in the south and southwest parts of Spain, including the provinces of Salamanca, Ciudad Real, Cáceres, Badajoz, Seville and Córdoba. The term “Black” or “Pata Negra” refers to the color of the pigs’ nails, (hooves), which are white in most traditional pork breeds, but black for the Black Iberian breed. 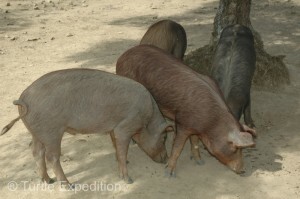 The pigs must be at least 75% Iberian to be claimed as such. 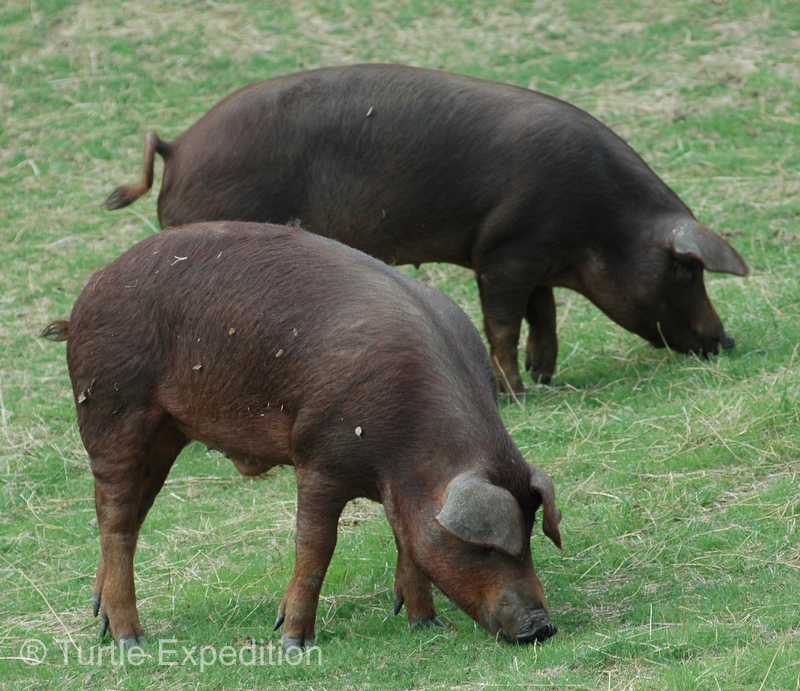 Many farmers like to cross breed them with the American Duroc Jersey which has a higher fat content. While as a general rule, a black nail should indicate an Ibérico ham, there are cases of counterfeits, with the nails being manually painted. With over two and half million acres of open oak forests (Spanish: Dehesa), historically the pigs roamed wild. In the fall they consumed huge quantities of acorns (Spanish: Bellota) as they dropped from the trees. At some point people started to notice the unique flavor of the meat. 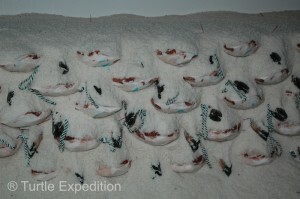 Pigs were slaughtered and hams were salted and hung to dry in the attics or some other cold place. The process today is basically the same on a larger scale. We were invited to visit the town of Monesterio, one of the main centers for the production of Jamón Ibérico de Bellota. 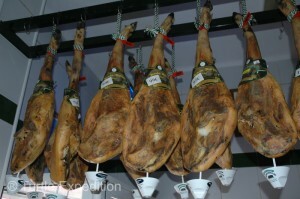 There are actually three grades of Ibérico ham. 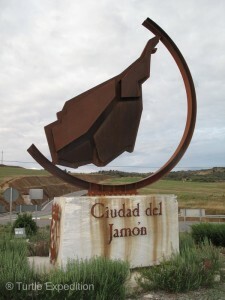 Jamón de Bellota, the highest quality and priciest ham comes from pigs that eat only acorns in the last few months of their lives. 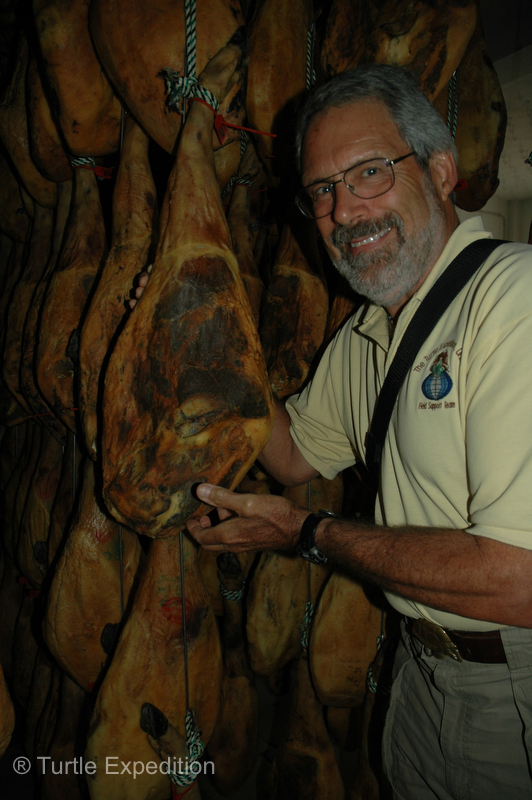 The two other types of ham are Recebo where the pigs are fed on a mixture of acorns and corn & grain, and the Cebo, where the pigs are only fed on corn & grain. 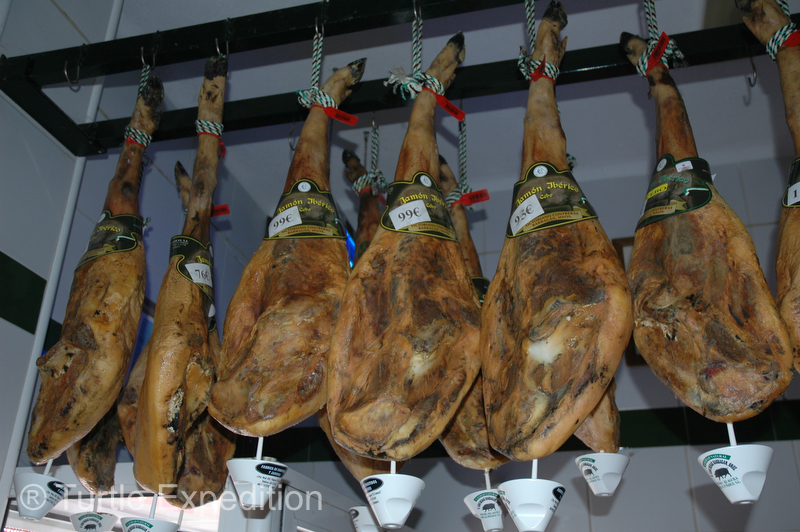 Sorry for the details here, but if you are tempted to buy some Bellota ham, you will be paying in excess of €78 per kilo ($47 a pound), sliced ready to eat, so you might as well know what you are paying for. In brief, once the pigs are slaughtered, the hams are trimmed and salted for a specific number of days, (10 kilos=10 days, etc. 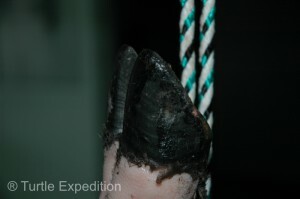 ), washed, and stored in a cold room at 3°C to 6°C (37°F to 43°F) for 45 days. 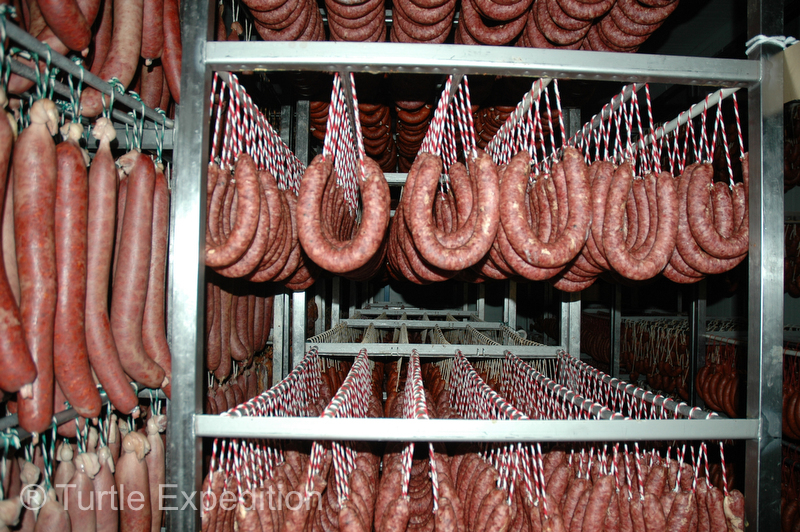 Then they are stored and aged in a second room at 15°C to 25°C (59°F to 77°F) for up to four years. The curing is a slow process. 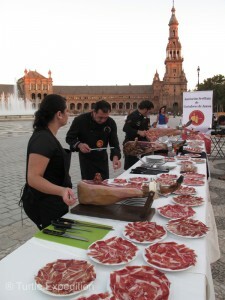 The result is the famous Jamón Ibérico de Bellota, prized both for its smooth texture and rich, savory taste. A good Ibérico ham has regular flecks of intramuscular fat (marbling). 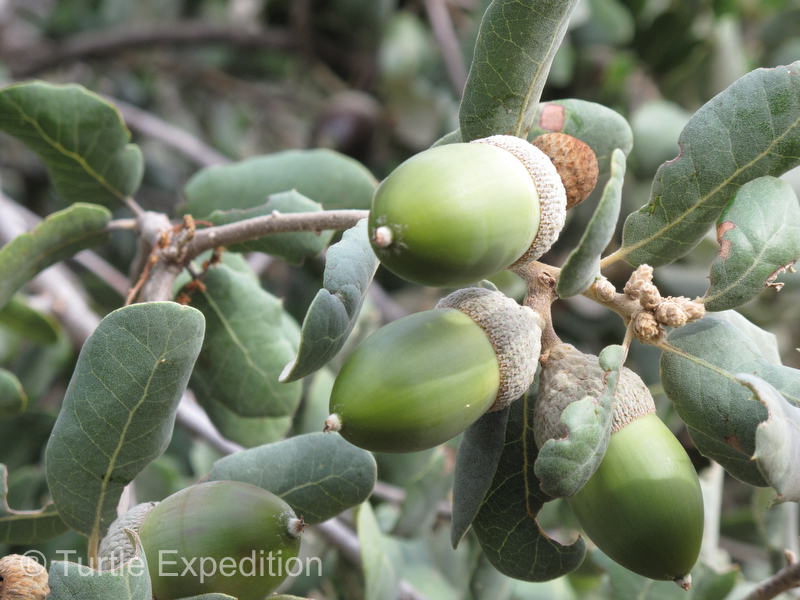 Because of the pig’s diet of acorns, much of the fat is oleic acid, a monounsaturated fatty acid that has been shown to lower LDL cholestrol and raise HDL cholesterol. 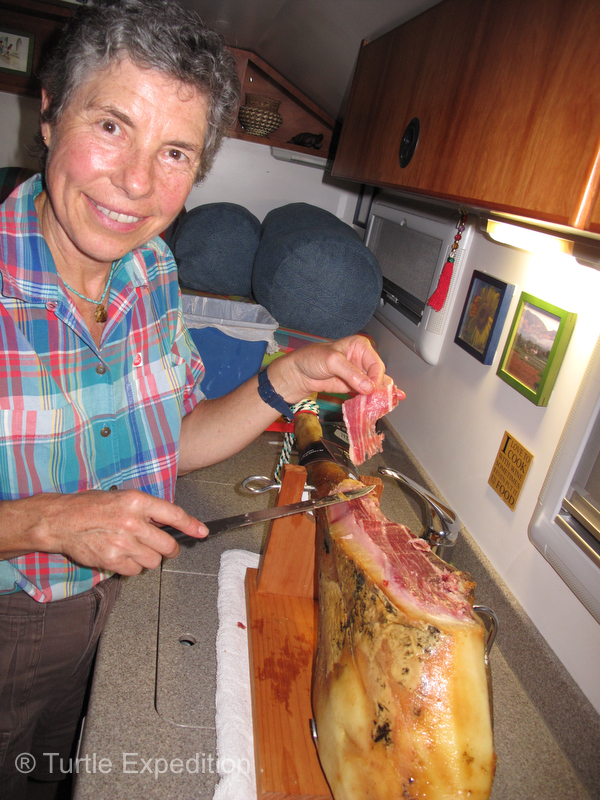 During our visit to the Victoriano Contreras Barragan ham-processing center, they found out it was Monika’s birthday and presented her with a whole 5.5 kg (12 lb) Jamón de Bellota, complete with a stand and a special ham-slicing knife. 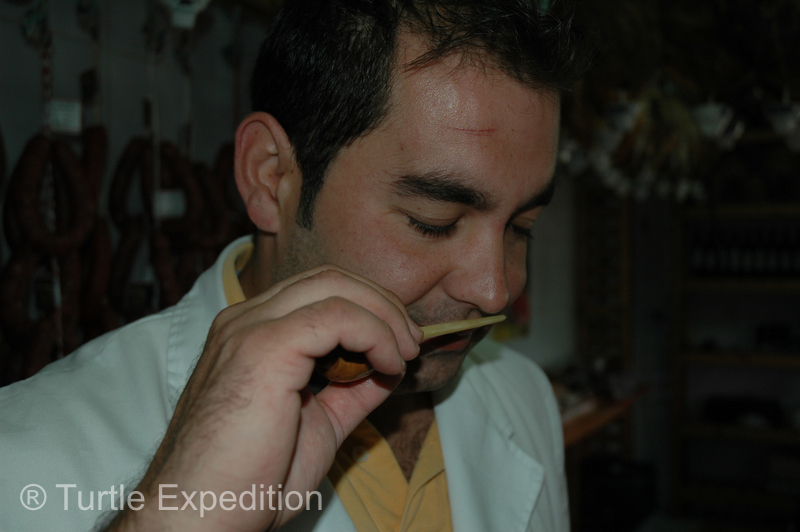 It travels well and we are working hard to reduce our LDL cholesterol and practicing La Cultura del Jamón by placing thin slices of ham on our tongue and letting the flavors be discovered! What can you do with two and half million acres of open oak forests? Answer: Grow fat pigs. These cute pigs will munch on acorns in the fall and end up as some of the most expensive and delicious ham in the world. The town of Monesterio, a short drive from Seville, is called the “City of Ham”. We found out why. A visit to the fabulous Ham Museum in Monesterio gave us a better understanding of why the Jamón de Bellota is famous in Spain and other countries of Europe. 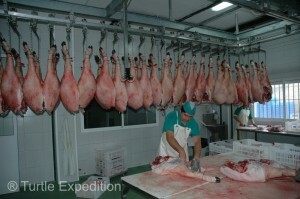 After the animals are slaughtered, butchers trim the legs and prepare them for the salting process. 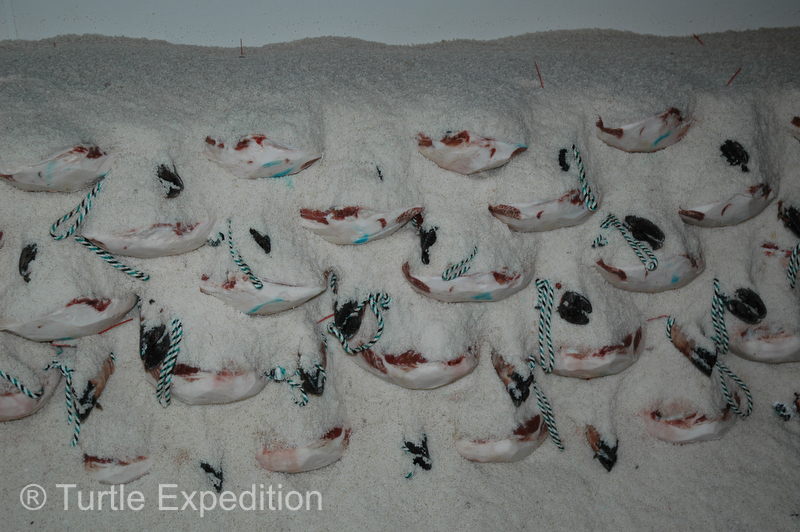 The fresh hams are packed in pure rock salt for a specific number of days based on their weight. 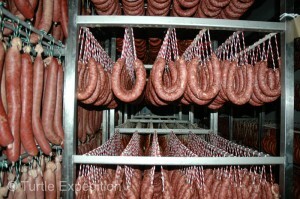 In addition to the famous hams, all other parts of the pig are used for normal meat cuts and special aged chorizo sausages. 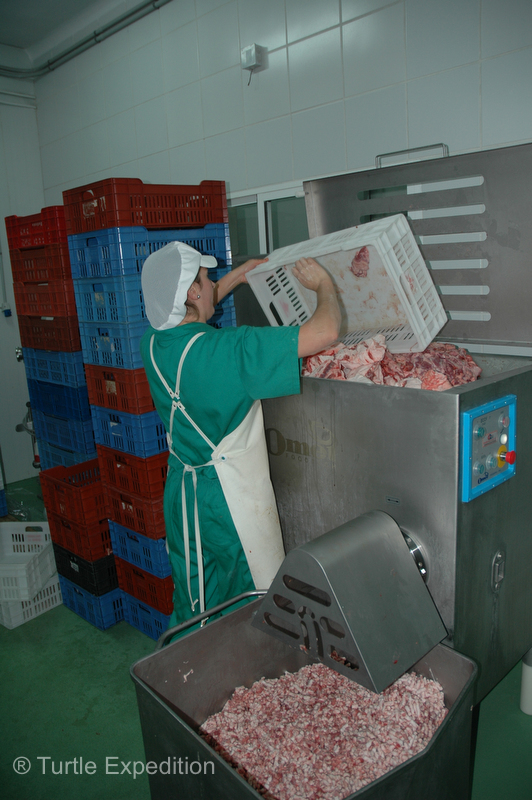 Once the salting process is done, the hams are washed and stored at 3°C to 6°C (43°F to 37°F) for 45 days. Do they make air fresheners that smell like a Bellota ham? 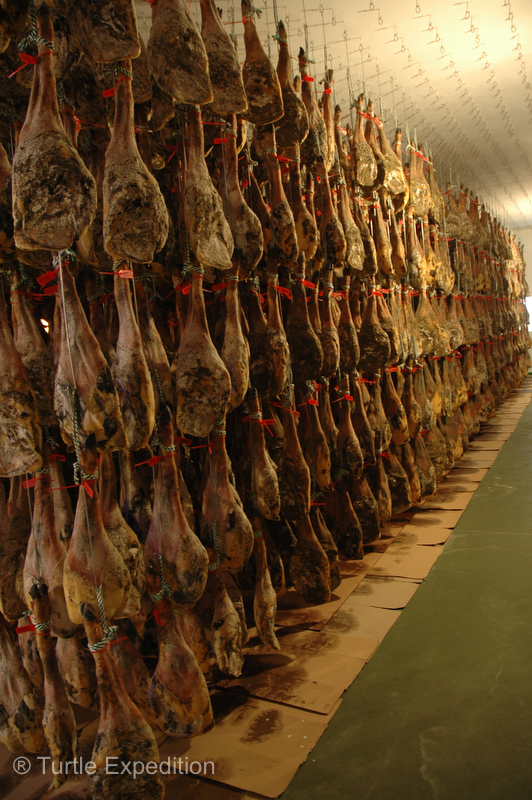 With the first cooling process finished, the hams are aged and cured naturally at 15°C to 25°C (59°F to 77°F) for up to four years. These hams are ready for sale in the adjacent butcher shop. The cups keep the drips safely away from the clients’ heads. 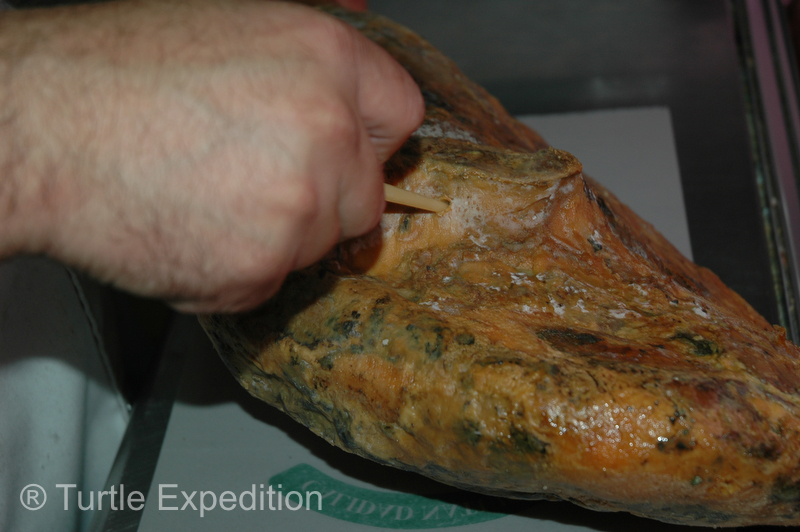 Before each ham is sold, it is inspected and tested (smelled) for flavor and purity using a special test stick made from a cow bone. Angel Contreras, the director of the company, tests (smells) the ham to make sure it’s ready for sale. 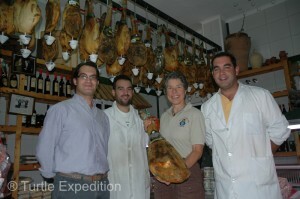 For her birthday, the three Contreras cousins , Rafael, Eduardo and Angel presented Monika a whole 5.5 kg (12 lb) Jamón Ibérico de Bellota. Wow! 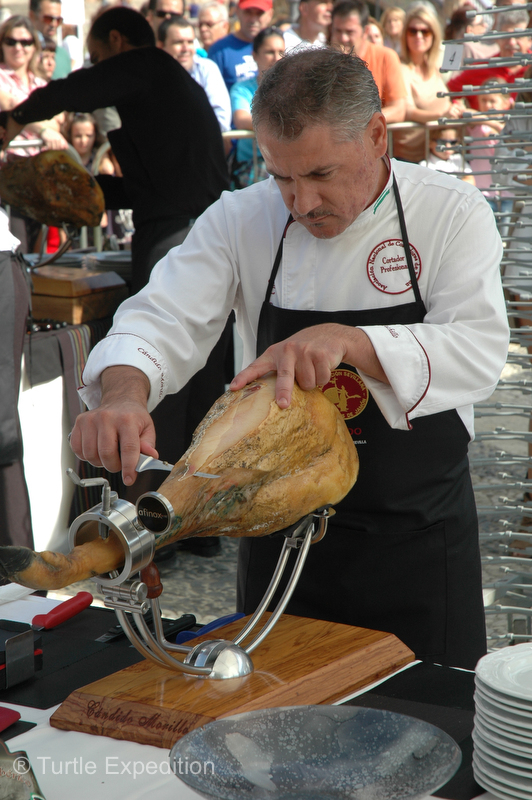 If you are going to spend €99 ($136) for a whole Jamón Ibérico de Bellota for a special party, you should hire a professional to come and carve it for you. This is a real art in itself. Monika is getting better at the ham-slicing stand. The thin slices melt in your mouth. If you buy a ham you can hire her. Don’t bother me. 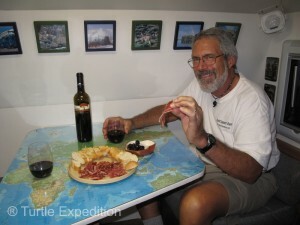 I’m lowering my LDL cholesterol.